A man accused of setting off bombs in New Jersey and New York seven months ago, injuring dozens of people, asked a judge on Wednesday to move his trial to Vermont to avoid the possibility potential jurors have been influenced by prejudicial publicity about the case. Lawyers for Ahmad Khan Rahimi, an Afghanistan-born U.S. citizen, said in court papers he would get a fairer trial in Burlington, Vermont. They said an expert analysis shows that media coverage of his case in Manhattan newspapers was twice as heavy as occurred in Washington, D.C., and five times as much as in Burlington publications. Rahimi, who lived with his family in Elizabeth, New Jersey, is charged with detonating a pipe bomb along a charity race in Seaside Park, New Jersey, and planting two pressure cooker bombs in Manhattan on Sept. 17. One device did not explode. The other one detonated in the Chelsea neighborhood, injuring 30 people. The man accused of planting bombs in New York and New Jersey last summer is set to face a judge Tuesday morning. Ahmad Rahimi will answer to charges that he tried to kill police officers during a shootout in Linden. Tracie Strahan reports. Rahimi, who has pleaded not guilty, is detained without bail. Defense lawyers say their analysis shows that about 90 percent of respondents to their survey were aware of Rahimi's case and that those who answered questions had a "comparatively strong presumption of guilt." They said a high number of the respondents said they were in the Chelsea neighborhood at the time of the attacks or knew someone who was. The lawyers wrote that prejudicial information that reached some respondents included reports of a confession, a near singular focus on Rahimi, inflammatory information and demonization of Rahimi as a terrorist. They also cited numerous statements by the government and tweets by former U.S. Attorney Preet Bharara about Rahimi and other aspects of his prosecution. Rahimi was hospitalized for weeks for treatment of wounds suffered in a police shootout during his Sept. 19 capture outside a bar in Linden, New Jersey. In New Jersey, he is charged with attempted murder for the gunbattle with five officers. 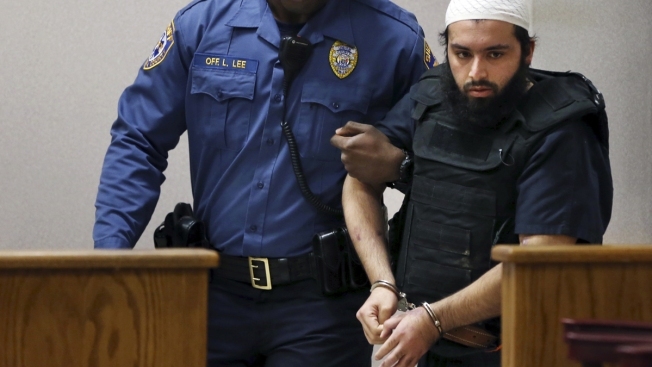 A man charged with setting off bombs in New Jersey and New York spoke with the FBI for days after his arrest as he was recovering from gunshot wounds, a prosecutor told a judge on Thursday. Erica Byfield reports. His Manhattan federal trial is scheduled for October. Lawyers in terrorism cases over the past few decades in Manhattan have frequently asked judges for a change of venue. None has been granted. Typically, the judges assume the potential jury pool has heard of the event and questions possible jurors individually to ensure they can still be fair.